Drilling activity has significantly increased from the past year, thus increasing the demand/ requirement for designing, modeling, visualization, and data capturing tools. E&P companies are in greater need for simulation tools and services that can help them maximize production and minimize errors in order to efficiently conduct the drilling process. For instance, according to the worldoil.com report, the U.S. was expected to drive the overall global drilling activity with around 18,552 drilled wells in the year 2017. Hence, this is a major factor which is boosting the growth of process simulation software in oil & gas market across the world. Furthermore, increase in overall expenditure by oil and gas companies around the globe is also likely to fuel the growth of this market. This is primarily due to the growing number of approved oil and gas projects around the globe. In order to efficiently accomplish these projects, oil and gas companies are investing in various technologies including simulation and 3D technology which plays a vital role in overall project initiation. The global market for process simulation software in oil & gas has been segmented on the basis of component, application, operation type, and geographic regions. On the basis of component, the market is segmented into software and services. Software segment is further categorized into cloud-based and on-premise. Services segment is categorized into consultancy, training, and support. In 2018, the software segment accounted for the largest market share in terms of revenue of the global process simulation software in oil & gasmarket. Furthermore, the services segment is expected to expand at a significant growth rate during the forecast period. Based on operation type, the market is segmented into onshore, off-shore, heavy oil processing, and unconventional. In terms of application, the global process simulation software in oil & gasmarket is segmented into upstream, midstream, oil & gas processing, refining, petrochemicals, and green engineering. Upstream application is further categorized into flow assurance, fluid properties, production facilities, equipment design and analysis, and gathering systems. Midstream application is further categorized into storage, pipeline integrity, flow dynamics, flow assurance (metering & economics), network analysis & optimization, and pipeline design and analysis & pipeline equipment. Oil and gas processing application is further segmented into oil and gas separation, sulfur recovery, sweetening, CO2 freezing, liquefaction, dehydration, and cryogenic processes. Refining application is further bifurcated into crude oil distillation and heavy oil processing. Green engineering is segregated into HSE system and flaring. In 2018, upstream application accounted for the largest share of the market. However, oil & gas processing and refining application are anticipated to expand at a higher growth rate during the forecast period. 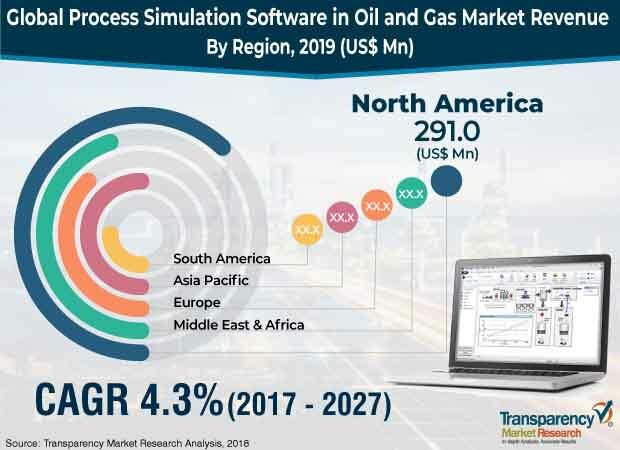 Based on geography, the global process simulation software in oil & gas market is bifurcated into North America, Asia Pacific, Europe, South America, and Middle East & Africa. Among these regions,North America accounts for the largest share in terms of revenue in the global process simulation software in oil & gas market. The U.S. is the largest oil and gas producer in the region and also is the most technologically advanced country. In 2018, the U.S. was the largest oil and gas producer. However, Middle East & Africa and Europe are also expected to contribute significant market share during the forecast period. The global process simulation software in oil & gas market includes different players such as Aspen Technology, Inc., Honeywell Process Solutions, KBC (Yokogawa), AVEVA Group Plc, Process System Enterprise, Ltd., Chemstations, Inc., Kongsberg Gruppen, GSE Systems, Inc., Virtual Material Group Inc. (Schlumberger), ProSim, EQ-Comp, Schneider Electric SE and Bryan Research & Engineering, LLC.